As it turns out, living things are amazingly diverse. As one measure of this diversity, conservative estimates place the number of species alive today at 8-10 million (Stork 1993; Hamilton et al. 2010; Wilson 2010, p. x; Mora et al. 2011), and this number likely represents less than one percent of all species that have ever lived (Raup 1991). Yet, as staggering as these numbers are, they vastly underestimate life's true diversity: all species consist of individual organisms that are themselves unique. Indeed, each species comprises a bewildering array of morphological, physiological, ecological, and behavioral traits (e.g., see Fig. 1.1b, c). In short, the total inherited variation of all organisms ("biodiversity"; Wilson and Peter 1988) is truly astounding. Biodiversity demands explanation. Why are there so many different species? Why do species typically express different traits, especially when these traits influence resource acquisition or reproduction (e.g., see Fig. 1.1b)? Why do species harbor so much trait variation within them, which, in some cases, is as pronounced as that normally seen between species (e.g., see Fig. 1.1c)? What factors trigger the formation of new traits and new species in the first place? Finally, once new species do arise, why do they sometimes coexist and sometimes not? This book explores how competitively mediated selection generates biodiversity. In particular, we examine how such selection--whether stemming from competition for resources or access to successful reproduction--can promote evolutionary diversification through a process known as "character displacement" (sensu Brown and Wilson 1956). Although evolutionary biologists have long recognized that numerous factors can act as agents of selection and thereby potentially promote diversification (reviewed in MacColl 2011), competition may be the most common of all selective agents (Vermeij 1987; Amarasekare 2009). Moreover, because competition (unlike, for example, predation) is uniquely mutually costly to both parties involved (Table 1.1), it is a particularly potent agent of divergent selection, which can serve as a wedge that drives competitors apart ecologically and phenotypically. In this opening chapter, we summarize the history of the discovery of character displacement and describe how the process of character displacement is often conflated with the patterns that are predicted to arise from it. We also provide a formal definition of character displacement that avoids such confusion. We conclude the chapter with a discussion of how character displacement serves to unify evolutionary biology and ecology. With these words, Darwin first proposed that competition acts as a ubiquitous and potent agent of divergent selection. Darwin's ideas were groundbreaking, because none of his predecessors had viewed interactions among organisms as being significant in evolution (Ridley 2005). The crux of Darwin's idea is that when organisms compete for scarce resources, natural selection should favor those individuals that are least like their competitors. Consequently, groups of organisms that compete should become more dissimilar over time. Darwin considered this process, which he dubbed "divergence of character", to be "of high importance" for two reasons. First, he held that this process was crucial in the origin of species. According to Darwin, selection that minimizes competition between "varieties" could drive divergence between them until they became separate species (see the second quote above). Darwin's view of evolution was entirely different. His imagery was that of a tree, in which ancestors and descendants split and coexisted. Moreover, according to Darwin, when evolutionary lineages split, they tended to produce two new lineages that diverged from one another, thereby accentuating the tree-like pattern (Fig. 1.2b). Darwin held that evolution's divergent nature could be traced to the tendency for the strength of competition to decrease with increasing divergence between competitors (see the third quote above). Thus, according to Darwin, by continually eliminating intermediate forms, competitively mediated selection has caused species to differ and the history of life to resemble a tree, with numerous, diverging branches. As the above discussion indicates, the concept of divergence of character was crucial to Darwin's thinking on the origin and diversity of species. Indeed, Darwin devoted as much space in The Origin to discussing divergence of character as he did to discussing the idea for which he is most widely known--natural selection (Ridley 2005). Yet, despite the importance that Darwin attached to his principle of divergence of character, he failed to provide any actual examples of competitively mediated divergence in contemporary species (as an aside, although some have questioned whether Darwin's principle of divergence of character is actually synonymous with character displacement [reviewed in Pfennig and Pfennig 2010], Darwin's statements from the quotes above that, "more living things can be supported on the same area the more they diverge" and that "each new variety or species ... will generally press hardest on its nearest kindred," suggest that he envisioned the modern process of character displacement, in which sympatric species diverge owing to the action of competitively mediated selection). As it turns out, for Darwin to come up with examples of competitively mediated divergence in contemporary species would have been no trivial exercise. Indeed, competitively mediated divergence can be notoriously difficult to detect. On the one hand, if two species are phenotypically similar enough to compete, then they probably have not undergone much divergence. On the other hand, if two species have already undergone competitively mediated divergence, then they are probably no longer similar enough to experience much competition with each other that an investigator could detect. In developing these ideas, Lack drew on his detailed studies of finches from the Galápagos Islands. This archipelago contains over a dozen endemic species of finches, many of which co-occur on some islands but not on other islands (Grant 1986; Grant and Grant 2008). Interestingly, Darwin visited the Galápagos Islands as a young man in 1835, and these same finches--now referred to as Darwin's finches (Lack 1947)--were crucial in sparking Darwin's thinking about evolution and natural selection (Browne 1995). Indeed, according to Sulloway (1982), Darwin was convinced that competitively mediated selection could explain why these species differ in the size and shape of their beaks. However, Darwin lacked evidence demonstrating that different beak morphologies were effective at reducing competition (Sulloway 1982). Although Lack made a convincing case for competition having played a role in the adaptive radiation of finches on the Galápagos Islands, an important question remained: how general was this phenomenon (Mayr 1947)? The answer to this question awaited publication of a landmark paper by Brown and Wilson (1956). This paper was important for three reasons. First, Brown and Wilson established that Galápagos finches were not unique. They sifted through the literature and applied the method of comparing sympatric and allopatric populations to taxa as diverse as insects, crabs, fish, amphibians, and birds. They presented several compelling cases in which species pairs were recognizably different in sympatry but not in allopatry, which suggested that competition may play a general role in promoting divergence between species. "... the situation in which, when two species of animals overlap geographically, the differences between them are accentuated in the zone of sympatry and weakened or lost entirely in the parts of their ranges outside this zone." Third, Brown and Wilson emphasized that a pattern of exaggerated divergence in sympatry may reflect selection to minimize both resource competition ("ecological" character displacement) as well as mismatings between species ("reproductive" character displacement). As an aside, in an earlier version of his book, Lack (1945) had actually suggested that differences in beak size also mediate species recognition signals, a conclusion that has been confirmed subsequently by Ratcliffe and Grant (1983). Such direct experimental demonstrations of character displacement are not feasible in many species. Nevertheless, most systems can be used to test key predictions of the hypothesis that competitively mediated selection promotes divergence between species. These experiments are conducted within a single generation and focus on species for which prior observational evidence exists to suggest that they have undergone character displacement (see below). For example, experiments have been used to test a crucial prediction of character displacement theory: that those members of a focal species that are the most similar to a heterospecific competitor in resource use or reproductive traits suffer the most from competition with that heterospecific (e.g., see Schluter 1994; Pfennig et al. 2007; Smith and Rausher 2008). In addition to these three classes of observational evidence, support for character displacement is strengthened when observational data also allow one to test more specific predictions. For example, finding that the degree of divergence between two species is positively associated with the frequency of interspecific interactions in any given population provides compelling evidence for character displacement (e.g., see Pfennig and Murphy 2002; Tynkkynen et al. 2004; Pfennig and Pfennig 2005; Goldberg and Lande 2006; Anderson and Grether 2010). Finally, with the advent of new DNA sequencing technologies, a complementary approach to those outlined above is to look for a molecular signature of character displacement. For example, once one has identified candidate genes involved in resource use or reproduction (see chapter 4), one could analyze patterns of genetic variation in these genes (relative to neutral genetic loci) to determine if selection has acted on any of them (e.g., see Charlesworth et al. 1997; Charlesworth et al. 2003; Durrett and Schweinsberg 2004; Nielsen 2005). As an illustration of this approach, Hopkins et al. (2011) investigated reproductive character displacement between two Texas wildflowers, Phlox drummondii and P. cuspidata. Previous experiments had demonstrated that competitively mediated selection favors floral color divergence as a means of minimizing hybridization between these species (Levin 1985). Hopkins and Rausher (2011) identified two genes involved in the flower-color change in sympatric populations of P. drummondii. An analysis of sequence variation in these genes revealed a signature of a selective sweep in one of the two genes, implicating selection as the cause of floral color divergence. Augmenting experimental or observational data with molecular data in this way is a particularly powerful approach for demonstrating character displacement. This is because molecular data integrates the effects of both neutral and adaptive divergence over much longer time periods and greater spatial scales than is possible with classical direct measurements of divergent selection (Hopkins et al. 2011). In sum, various approaches have been used to document character displacement. The result of these endeavors is the establishment of character displacement as a phenomenon that occurs and that is taxonomically widespread. Above, we described how much of the support for character displacement comes from observations of patterns in nature. We further noted that the most frequently cited such observation is a geographical pattern of trait variation in which species show exaggerated divergence in resource-use or reproductive traits when they are sympatric with each other compared to when each occurs in allopatry (Fig. 1.3). Yet, comparing sympatric and allopatric populations to deduce that competition has promoted trait evolution has limitations. Specifically, although a pattern of exaggerated divergence between sympatric species relative to allopatry is consistent with the notion that selection has driven trait evolution and thereby lessened resource competition or reproductive interactions, such a pattern is also consistent with the action of various other selective-and nonselective-processes. Here we discuss some selective and nonselective processes that could produce this pattern and that could therefore erroneously be taken as evidence that character displacement had occurred. Consider first that species and populations may differ for evolutionary reasons other than selection. For example, divergent phenotypes may come to predominate in a single ancestral sympatric population because of random genetic drift. Gene flow from this population into other sympatric populations may thereby result in multiple sympatric populations exhibiting the divergent phenotype. Yet, the presence of the divergent phenotype in multiple sympatric populations would be due to nonselective processes (i.e., genetic drift and gene flow) and would therefore not constitute character displacement (for a possible empirical example, see Marko 2005). One way around this problem is to test for "parallel" character displacement. Parallel character displacement is a special case of parallel evolution, which occurs when a similar trait evolves repeatedly in independently evolving lineages (see above). Such data are compelling evidence of selection's role in trait evolution (Clarke 1975; Endler 1986; Schluter and Nagel 1995). Thus, finding that the same divergent trait has evolved independently in replicate sympatric populations-and that each such sympatric population is most closely related to a nearby allopatric (pre-displacement) population rather than to another sympatric (post-displacement) population-implicates selection as having caused the divergence (e.g., see Hansen et al. 2000; Marko 2005; Matocq Murphy 2007; Rice et al. 2009; Adams 2010). Species and populations may also differ more in sympatry than in allopatry for selective reasons other than to lessen resource competition or reproductive interactions with another species. Indeed, several ecological interactions can generate patterns that may be mistaken for character displacement. One such interaction is intraguild predation, which occurs when species that share common resources also prey on each other (Polis et al. 1989; Holt and Polis 1997). Intraguild predation is common in nature (Polis et al. 1989), and it may generate a pattern of exaggerated differences between sympatric species that may be mistaken for character displacement. Specifically, if individuals are the most likely to prey on those members of a heterospecific population that are the most phenotypically similar to them (as might occur in many species; see Pfennig 2000), then such species would differ more in sympatry than in allopatry (Holt and Polis 1997). However, competitively mediated selection would have played no role in promoting divergence between these species. Another ecological interaction that may produce a pattern of divergent traits in sympatry relative to allopatry that could be mistakenly attribute to character displacement is "apparent competition." Apparent competition occurs when mutually antagonistic interactions between species arise due to shared predators or parasites; not due to shared resources (Holt 1977). With apparent competition, as one species increases in abundance, its predators and parasites also increase in abundance. Consequently, predation and parasitism on the other species increases as well, thereby potentially favoring divergence between species in resource use as a means of escaping predators or parasites (Brown and Vincent 1992; Abrams 2000). For example, enhanced predation and parasitism may drive each species into different habitats, which could then favor different resource-acquisition traits. A similar process could also generate divergence in reproductive characters. Indeed, because predators and parasites frequently locate their victims by keying in on their sexual signals (reviewed in Andersson 1994), selection to avoid such costly interactions may favor the production of divergent mating signals in sympatric species. This divergence might be mistakenly interpreted as reflecting reproductive character displacement. Above, we focused on the problem of comparing sympatry and allopatry to infer that character displacement had occurred. A pattern of overdispersion of traits in sympatry is also problematic for inferring character displacement, however. In particular, "species sorting" can produce patterns that could be mistakenly construed as evidence that character displacement had occurred. Species sorting was first anticipated by Rensch (1933; cited in Mayr 1947), and it occurs when species that just happen to differ in resource use are more likely to coexist than those that do not differ. Species sorting can arise either through the differential invasion into a habitat of species that happen to differ or through the differential extinction of species that happen to be too similar to coexist. For example, each of the small islands of the Lesser Antilles harbors either one or two species of Anolis lizards (Losos 1992). On two-species islands, the species differ in body size. However, large and small species come from two distinct evolutionary clades, suggesting that they already differed in body size before they came into contact with each other (Losos 1992). Thus, size differences between species appear to have arisen through species sorting rather than through character displacement, in which each species evolved a different body size owing to the action of competitively mediated selection. Note, however, that on the large islands of the Greater Antilles, size differences among sympatric species appear to have arisen through character displacement (reviewed in Losos 2009). Before leaving this topic, however, we stress that an overly rigorous application of any such criteria can be as problematic as not applying the criteria in the first place. Indeed, by applying these criteria too strictly, one runs the opposite risk of falsely rejecting some actual instances of character displacement. We return to this issue in chapters 2 and 4, when we discuss the possible role of environmentally induced shifts in mediating character displacement. Additionally, as will be discussed in chapter 3, different forms of character displacement (i.e., ecological versus reproductive character displacement) can potentially produce similar patterns, and it is important to be aware of this. In sum, using a pattern of trait divergence as a proxy for the process of competitively mediated divergence-i.e., conflating a predicted pattern with the process hypothesized to produce it-is problematic without additional corroborating evidence to indicate that the hypothesized process has actually caused the pattern. However, this conflation of pattern and process runs even deeper than the issue of how to demonstrate character displacement. This conflation also reflects longstanding confusion over how to define character displacement, which is the topic we turn to next. As described above, Darwin (1859 ) hypothesized that competition drives trait divergence. To test this hypothesis, Lack (1947), and subsequently, Brown and Wilson (1956), relied on geographic patterns of trait variation to identify situations in which competitively mediated trait divergence might have unfolded. The logic of their approach was that selection arising from resource competition or reproductive interactions between species should lead to: (1) a process of divergence of resource-exploiting or reproductive traits between sympatric species; and, consequently, (2) a resulting pattern of geographical variation in which species show exaggerated divergence in these traits in sympatry (Fig. 1.3). As we have seen, however, using a pattern to infer a process is problematic, because patterns of exaggerated divergence can be explained by the process of competitively mediated divergence, but they can also be explained by various processes other than competitively mediated selection. Yet, such a conflation of process and pattern has long plagued the study of character displacement. Indeed, in the case of ecological character displacement, this conflation of process and pattern provoked a spirited debate over what constituted "true" character displacement (Grant 1972; Strong et al. 1979; Simberloff and Boecklen 1981; Arthur 1982; Diamond et al. 1989; reviewed in Schluter 2000). Central to this debate was the realization that numerous selective and nonselective factors can cause species to exhibit exaggerated divergence in sympatry (see above). In fact, serious reservations arose about whether competition played any role in generating trait divergence (Strong et al. 1979). What emerged from this debate was the realization that defining character displacement in terms of a pattern of geographical variation breeds confusion over which (if any) cases of exaggerated divergence in sympatry actually reflect selection stemming from resource competition or reproductive interactions between species. "... the process by which a morphological character state of a species changes under natural selection arising from the presence, in the same environment, of one or more species similar to it ecologically and/or reproductively." Most researchers in the realm of ecological character displacement now follow Grant's suggestion and define ecological character displacement in terms of process, thereby reducing confusion over what does, and what does not, constitute character displacement (e.g., see Schluter 2001, 2002). Although the field of ecological character displacement is largely reconciled as to what constitutes character displacement, the field of reproductive character displacement has achieved no such resolution (despite the fact that Grant's  definition also applied to reproductive characters; see above). Consequently, conflation of pattern and process is widespread when dealing with reproductive character displacement. Indeed, some define reproductive character displacement in terms of pattern rather than process. Yet, as we stressed above, patterns of trait divergence can be generated via processes other than selection to avoid interactions with heterospecifics. As we noted above, apparent competition, for example, could cause reproductive trait divergence between sympatry and allopatry. Defining reproductive character displacement in terms of process, rather than pattern, therefore has the same benefit that a process-oriented definition has for ecological character displacement: researchers can focus specifically on the ecological and evolutionary implications of competitive interactions between species driving reproductive trait divergence. Moreover, defining ecological and reproductive character displacement in the same way is critical for understanding how the two processes interact. If the two fields define character displacement differently, then the ability to address questions regarding how and why ecological and reproductive character displacement interact will be hampered. A problem that has uniquely faced the field of reproductive character displacement must necessarily be addressed before we conclude with the formal definition of character displacement that we will use throughout the book. Namely, what is the relationship between reproductive character displacement and "reinforcement"? Reinforcement is generally defined as trait evolution stemming from selection that minimizes hybridization between species (Howard 1993; Servedio and Noor 2003; Coyne and Orr 2004). Our usage of character displacement so far would suggest that we do not consider reproductive character displacement and reinforcement separate phenomena. Indeed, we hold with many of the founders of the field who did not see reproductive character displacement and reinforcement as distinct processes (Brown and Wilson 1956; Blair 1974). For example, W. F. Blair-who is credited with coining the term "reinforcement" (Brown and Wilson 1956; Coyne and Orr 2004)-considered reinforcement "a rather restricted form of character displacement" (Blair 1974, p. 1119). How then did reinforcement come to be distinguished as a separate process from reproductive character displacement? One of the most influential definitions of reproductive character displacement was that of Butlin and Ritchie (1994). They stated that reproductive character displacement is "the process of divergence in mating signal systems between reproductively isolated species" (Butlin and Ritchie 1994, p. 62). By defining reproductive character displacement in this way, they distinguished it from reinforcement. Thus, whereas reinforcement was defined as arising from interactions where species could actually exchange genes during mating, reproductive character displacement was deemed to arise from all other mating interactions (Butlin 1987; Butlin and Ritchie 1994). Butlin and Ritchie (1994) saw this distinction as important, because, at the time, theoretical models suggested that reinforcement was unlikely to ever occur. In forging such a distinction, they established a critically important standard for demonstrating reinforcement. Yet, recent theoretical and empirical advances have confirmed that reinforcement is possible and more common than once assumed (reviewed in Servedio and Noor 2003). Thus, the motivation for treating reproductive character displacement and reinforcement as distinct processes is seemingly reduced. Indeed, as we highlight in the next chapter, whether via hybridization or by other reproductive interactions, both the underlying agent of selection (reproductive interactions with other species) and the underlying target of selection (traits associated with reproduction) are the same, regardless of whether the process is called "reinforcement" or "reproductive character displacement." Nevertheless, many still maintain that reinforcement should be considered a distinct process because of its importance in speciation. As we shall see in chapter 8, however, character displacement (whether by reinforcement or not) plays a critical role in both finalizing and initiating speciation. We therefore hold with the view that reinforcement is a case where reproductive character displacement unfolds owing to selection that lessens a specific type of reproductive interaction with heterospecifics: hybridization. That is, reinforcement is a "restricted form of reproductive character displacement" (Blair 1974). Nevertheless, because this book cannot provide a final resolution to this debate, we will use the term "reinforcement" as appropriate, so that readers with alternative definitions can still access the concepts and ideas we develop without confusion. Above, we emphasized the need to distinguish between character displacement and the patterns that potentially arise from it. Because the process underlying a pattern is what matters in terms of understanding how and why traits evolve, we hold with previous authors (Grant 1972; Howard 1993; Schluter 2001, 2002; Grether et al. 2009) that character displacement--whether arising due to competition for resources or access to successful reproduction--should be defined as a process and not a pattern. We therefore define "character displacement" as trait evolution that arises as an adaptive response to resource competition or deleterious reproductive interactions between species. Later, in chapter 5, we broaden this definition to include selection acting within species, a process termed "intraspecific character displacement." Whether selection operates within or between species, however, we define character displacement in terms of process. We do not coin a special term to describe the patterns that are predicted to arise from the process of character displacement; instead, we describe the actual pattern that is generated by character displacement (e.g., when discussing exaggerated divergence between sympatric species, we use the phrase "exaggerated divergence between sympatric species"). Our justification for doing so is twofold: first, the process of character displacement can produce patterns other than exaggerated divergence (see Box 1.1); and, second, we hope to minimize the potential for conflating pattern and process as described above. Moreover, starting with Brown and Wilson (1956), most evolutionary biologists have recognized distinct forms of character displacement. Two forms, in particular, are widely accepted. The first of these, "ecological character displacement" (sensu Slatkin 1980; Schluter 2001), refers to trait evolution stemming from selection arising from resource competition between species. Therefore, this process acts on traits associated with resource use (e.g., morphological structures such as beaks and jaws). A second, widely recognized form, "reproductive character displacement" (sensu Crozier 1974), refers to trait evolution stemming from selection that minimizes deleterious reproductive interactions between species. Therefore, this process acts on traits associated with reproduction (e.g., sexual traits or female mate preferences; see Fig. 1.5). In addition to these two forms, Grether et al. (2009) recently proposed a third form of character displacement: agonistic character displacement. Although we will not use this term in our book (in our view, all cases of character displacement can be categorized as either ecological or reproductive character displacement), the basic idea behind agonistic character displacement is useful and one that we return to in the next chapter. Namely, that agonistic interactions stemming from competition, whether for access to resources (Adams 2004; Peiman and Robinson 2007, 2010) or successful reproduction (Tynkkynen et al. 2004; Anderson and Grether 2010), can promote trait evolution. Throughout the book, we will use the term "character displacement" when the principles that we are discussing apply to both ecological and reproductive character displacement. However, when the principles apply to only one form of character displacement, we make clear which form we are discussing. More generally, a major theme of this book is that the basic proximate and evolutionary mechanisms by which ecological and reproductive character displacement unfold are similar. Moreover, as we explain in chapter 3, these two forms of character displacement can interact in consequential ways. Indeed, the interaction between these two processes can leave an important imprint on the history of life. In this book, we maintain that the study of character displacement can be used to answer fundamental questions in evolutionary biology and ecology regarding the origins of biodiversity. In particular, we address seven key questions throughout the book: Why do closely related species typically express different resource-acquisition or reproductive traits? Why do species harbor so much trait variation within them? How do novel, complex traits originate in the first place? How do new species arise? Once they do arise, how do species coexist? Why is evolution generally divergent in nature? Finally, why is evolution frequently escalatory? In addressing these questions, we will highlight how the study of character displacement can help unify alternative perspectives on the origins and maintenance of diversity in two keys ways. First, the study of character displacement can illuminate how evolutionary processes acting within species translate into major evolutionary change above the level of species. That is, character displacement can link "microevolution" and "macroevolution". The relationship between microevolution and macroevolution has long been the focus of debate in evolutionary biology [for recent discussions, see Gould (2002) and Carroll (2005)]. Throughout the book, we will suggest how character displacement--a microevolutionary process--can potentially explain certain macroevolutionary patterns, such as the divergent nature of evolution (Fig. 1.2b), the widespread tendency for evolutionary lineages to increase in size over time (Alroy 1998; Benton 2002; Payne et al. 2009), and the tendency for certain clades to diversify more widely and rapidly than others (e.g., Sepkoski 1984; Mitter et al. 1988; Foote 2000; Sahney et al. 2010). Second, character displacement inexorably links the fields of ecology and evolution. We underscore throughout the book how character displacement can bridge our understanding of ecological and evolutionary processes. Moreover, although the study of resource competition in relationship to ecological patterns (particularly community dynamics) has a long history (see MacArthur 1972 and references therein), relatively little work has examined how reproductive interactions between species affect ecological processes. This is particularly surprising given that, compared to resource competition, reproductive interactions between species may be no less important--and, in some cases, may even more important--for explaining ecological patterns and processes (e.g., see Gonzalez-Voyer and Kolm 2011). Brown, W. L., and E. O. Wilson. 1956. Character displacement. Systematic Zoology 5:49-64. This is the paper that first brought the concept of character displacement to the attention of many scientists. Darwin, C. 1859 (2009). The annotated Origin: a facsimile of the first edition of On the origin of species. Cambridge, MA, The Belknap Press of Harvard University Press. This is the book in which Darwin first laid out his principle of divergence of character (i.e., character displacement). The annotated version by J. T. Costa is highly recommended. Grant, P. R., and B. R. Grant. 2008. How and why species multiply: the radiation of Darwin's finches. Princeton, NJ, Princeton University Press. An easily read overview of the ecology and evolution of Darwin's finches. Ridley, M. 2005. How to read Darwin. New York, Norton. This short, highly readable book describes Darwin's principle of divergence of character. The author also focuses on how Darwin viewed this principle as crucial in explaining the divergent nature of evolution. Schluter, D. 2000. The ecology of adaptive radiation. Oxford, U. K., Oxford University Press. This scholarly monograph explores in detail the ecological causes of adaptive radiation, including the role of character displacement. The author also describes how to detect character displacement in natural populations. Wilson, E. O. 1992. The diversity of life. Cambridge, MA, Harvard University Press. This book presents an excellent overview of the causes and consequences of biodiversity. It also includes a clear description of how character displacement arises. Evolutionary biology has long sought to explain how new traits and new species arise. Darwin maintained that competition is key to understanding this biodiversity and held that selection acting to minimize competition causes competitors to become increasingly different, thereby promoting new traits and new species. Despite Darwin’s emphasis, competition’s role in diversification remains controversial and largely underappreciated. In their synthetic and provocative book, evolutionary ecologists David and Karin Pfennig explore competition's role in generating and maintaining biodiversity. The authors discuss how selection can lessen resource competition or costly reproductive interactions by promoting trait evolution through a process known as character displacement. They further describe character displacement’s underlying genetic and developmental mechanisms. The authors then consider character displacement’s myriad downstream effects, ranging from shaping ecological communities to promoting new traits and new species and even fueling large-scale evolutionary trends. 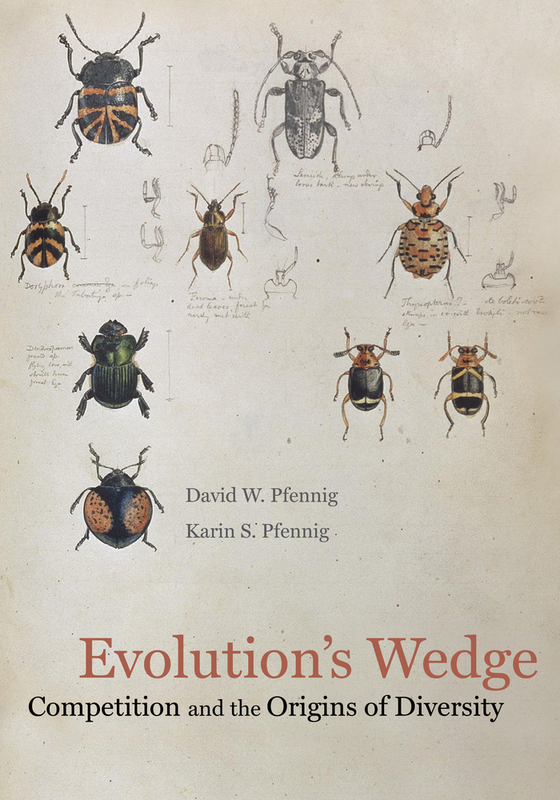 Drawing on numerous studies from natural populations, and written for a broad audience, Evolution’s Wedge seeks to inspire future research into character displacement’s many implications for ecology and evolution. David W. Pfennig is Professor of Biology at the University of North Carolina. Karin S. Pfennig is Associate Professor of Biology at the University of North Carolina. Box 2.2: Is Competitively Induced Plasticity Character Displacement? How are Species Boundaries Maintained? Macroevolution: Red Queen or Court Jester?